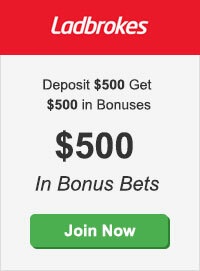 Melbourne Cup news, tips, form, betting strategies, giving you the info you need to help you win. 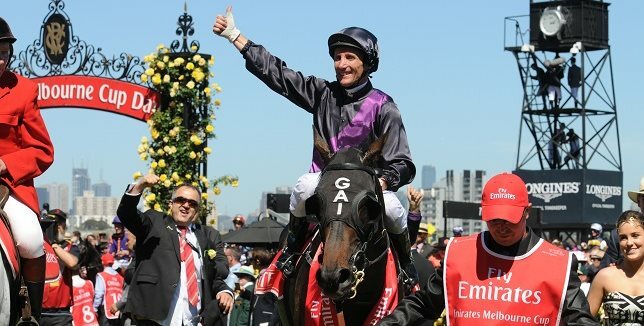 We reveal to you the secrets we have learned over the past 30 years of picking and backing horses and give you our secrets to picking Melbourne Cup Winners. For the 24 horses that will contest the 2018 edition of the Melbourne Cup, the long road to Flemington has already begun. And similarly as punters, it is our job too to start our homework and preparation this far out from home. Indeed, getting a ‘feel’ for the Melbourne Cup’s annual story as early as possible is critically important in identifying the eventual winner. 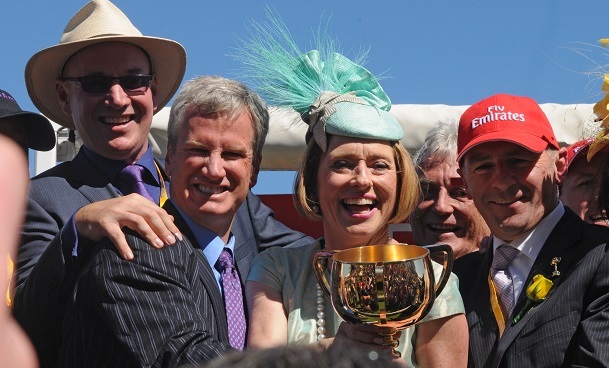 Gai Waterhouse and Andrew Roberts, celebrate their Melbourne Cup winnning horse Fiorente, 2013. 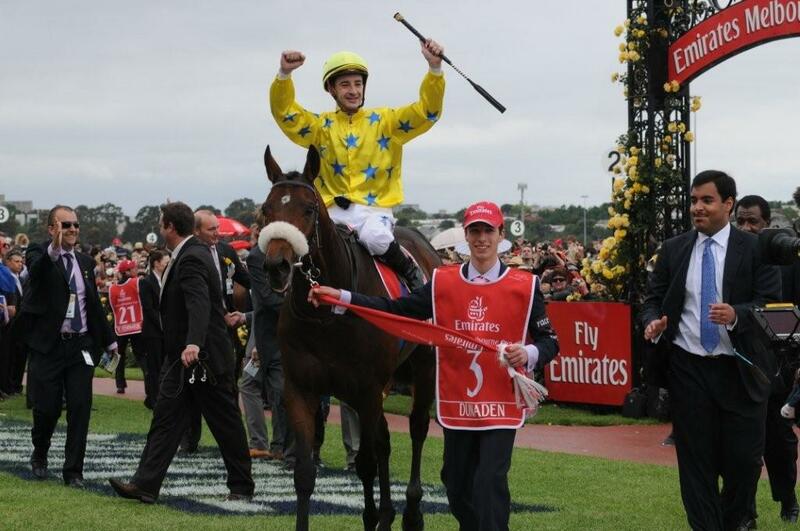 Media Puzzle at 250/1, Dunaden at 100/1, Delta Blues 20/1, Viewed 50/1, Ethereal 33/1 and Fiorente. Now he dissects the 2018 Melbourne Cup and names his TOP long-range selections. PLUS we will give you the Late Mail the morning of the Cup! Find out the 'Ten Key Form Factors' that you should consider when assessing the Melbounrne Cup field. Identifying the Melbourne Cup winner should be a priority for all serious punters ... the amount of ‘mug’ money that floods the TAB pools on Cup day often creates false markets, with the presence of ‘boom’ horses gifting punters luxurious odds about other less ‘popular’ gallopers that on form, should be far shorter. Discover the Key factors for Cup Success. 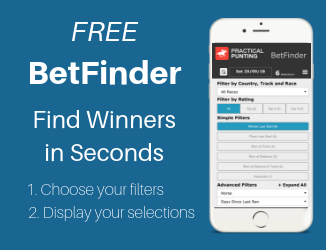 Looking for the best odds on your Melbourne Cup runner? Whether you a bet just once a year or a seasoned punter, you should grab the best Melbourne Cup 2018 odds possible. 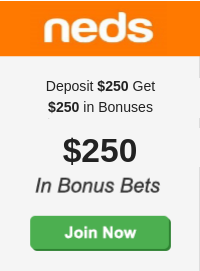 Don't line up at a packed betting outlet ... online bookies are both quickest and easiest way to have a bet. 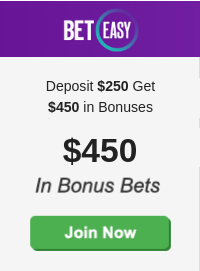 Our Melbourne Cup betting page lists all the key bonus bets and betting deals available with our recommended bookmakers! A Horse Racing Form Guide provides a wealth of information. 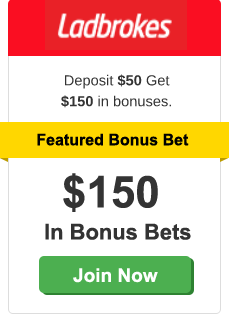 Learn the meaning of form and how to find those winning selections. The 2017 Melbourne Cup has been run and won with Rekindling saluting in fine fashion! Trained by Joseph O'Brien and ridden superbly by Corey Brown, Rekindling outstayed his rivals to win by half a length over Johannes Vermeer, with 2015 runner-up Max Dynamite coming thrid. Full results and finishing order below. 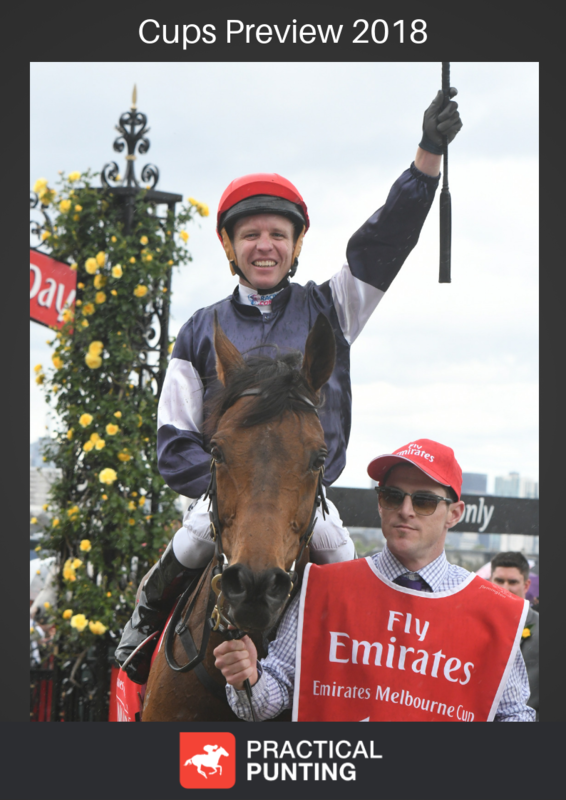 The 2016 Melbourne Cup was won by Almandin, trained Robert Hickmott and and ridden by Kerrin McEvoy, narrowly beating Heartbreak City, with race favourite Hartnell running third. The Melbourne Cup is on Tuesday, 06 November 2018. It is race number 7 in the Melbourne Cup day carnival held at Flemington Racecourse, VIC. 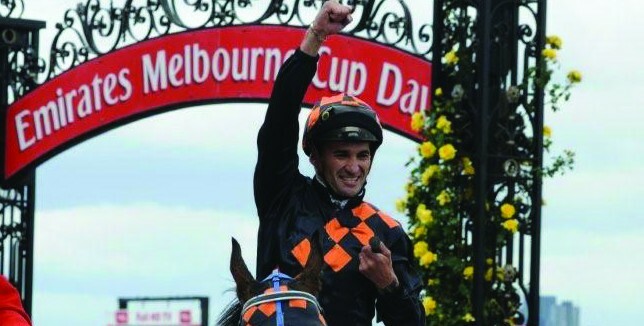 How many horses in Melbourne Cup? There are 24 horses in the Melbourne Cup with no emergencies. The race is open to horses three years and older. Each year hundreds of horses are nominated with the owners required to pay increasing fees as the race day approaches. The final field is determined by a balloting system that takes into account factors such as previous race form, prize money in the last two years and allocated handicap weight. Each year hundreds of horses are nominated by their connections for the Melbourne Cup. 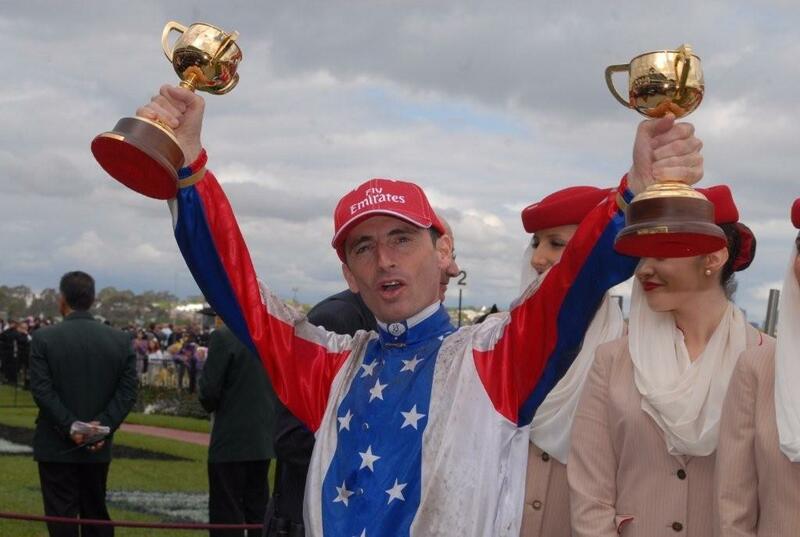 The Melbourne Cup draws the largest on the Australian racing calendar with up to 24 runners. The 2018 Melbounre Cup Final Field and Formguide will be available on November 4. Once the final field is set on the Saturday prior to the race, the barrier draw is then held. The Melbourne Cup is known as the ‘race that stops the nation’ in Australia. At 3200m and with a prize pool of $6.2m, it’s the richest "two-mile" handicap in the world and one of the riches turf races. 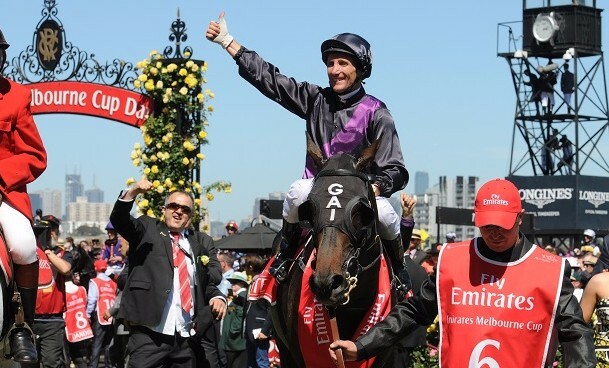 Always held on the first Tuesday in November at 3:00pm, the Melbourne Cup is open to three-year-olds and over, conducted by the Victoria Racing Club on the Flemington Racecourse in Melbourne, Victoria and is part of the Melbourne Spring Racing Carnival. For many people, the Melbourne Cup is often the only time they’ll take a punt on the horses. Since 1861 the combination of a long race (3200m) and large field (24 horses), means upset wins from outside chances are common. That said there have been star horses as well; with Makybe Diva winning 3, followed by Think Big with 2. Legendary trainer Bart Cummings, won a total of 12 Melbourne Cups before his death in August 2015. So eveyone’s in with a chance; even if it’s via the office-sweep stake where those unfortunate enough to get the horse that runs last, often get their money back. Melbourne Cup day is a public holiday in Melbourne with crowds of around 100,000 attending the Flemington Racetrack, located a short distance from the city centre. Melbourne Cup day has captured the public’s imagination with some attending in formal raceday wear and others letting their imaginations run wild with all manner of costumes. “Fashions on the Field” is a major aspect of the day with substantial prizes given to the best-dressed man and woman. Even for those not going to the race course, the Melbourne Cup is a good excuse for getting dressed up. Melbourne Cup Day is known for its fashion and there are luncheons held across the country and overseas by ex-pats. *NEW ACC ONLY, EXC NSW, SA, WA & VIC. TURNOVER REQUIREMENTS APPLY. SEE T&CS ON WEBSITE.